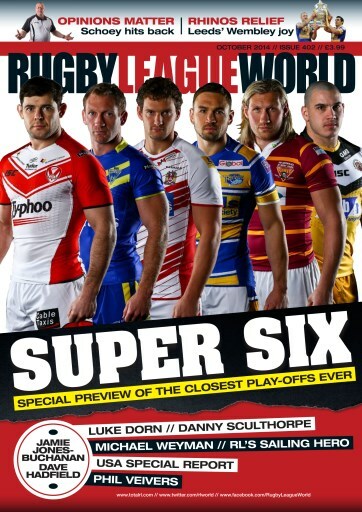 The Super League season is heading towards a thrilling climax - and we assess each team’s chances in the closest race for Old Trafford ever. The top six teams have dominated the competition all year, and we look at their prospects as well as outsiders Catalan Dragons and Widnes Vikings, and tip our own Grand Final winner. Elsewhere in another packed issue of Rugby League World, we look at Leeds Rhinos’ memorable Wembley triumph - while Nigel Wiskar spends an illuminating Challenge Cup final day in the near deserted town of Castleford. Jamie Jones-Buchanan sits down with media pundit and League great Garry Schofield, while Dave Hadfield looks at teams that have made a habit of coming second. Danny Sculthorpe lifts the lid on his own battle with depression and why he wants to share it with his fellow Super League stars, and there is a special report from the USA on the state of the game in America post-World Cup. We also chat to Super League’s Luke Dorn and Michael Weyman, and find out the remarkable story behind former York player Craig Forsyth’s journey sailing around the world. In the Championships we chart the career of Workington coach Phil Veivers, and there’s all the usual round-ups from Down Under, the women’s game and Academy scene.